Pedal Power Kennington had been looking forward to today's ride for months, ever since I'd found out it is possible for a group to go up the 334 steps of the Palace of Westminster Clock Tower and see Big Ben strike the hour! It's something very few people get the chance to do....and it's free at the moment (though an entrance charge is in the offing)! You have to write a letter of request to your MP and they can ask the authorities to arrange the visit for up to 16 people (a big thanks to Kate Hoey, our MP. You then send your list of people and other details about them to the authorities two weeks before the visit to get police clearance, and roll up at the appointed time on the day. The tour is brilliant, but you're not allowed to take photos so you'll have to book your own tour (or, for a sub-prime experience, watch it online ) . 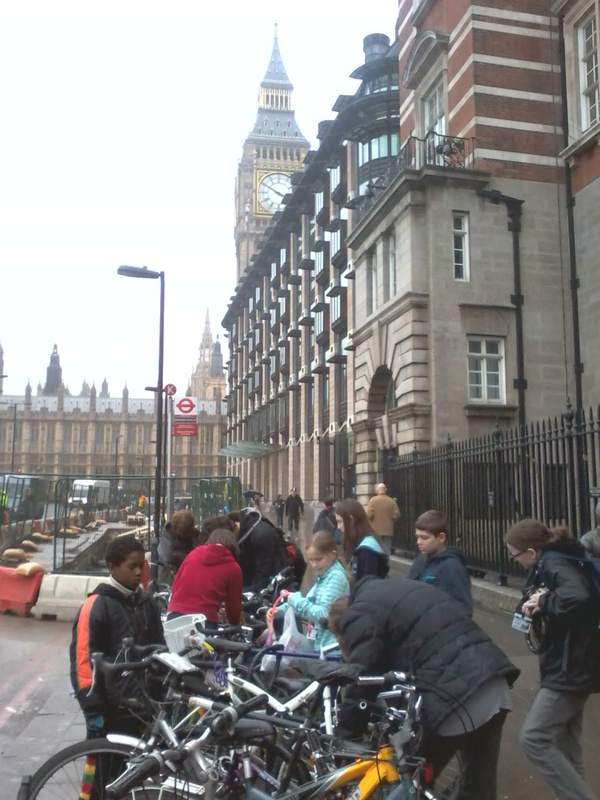 What made the trip even better for our group is that most of us live or go to school within sound of the bells, plus about half the group were born in St Thomas' Hospital directly opposite - the first photo of my daughter has the clock face in the background. We had a quick practice ride, then set off as it started to rain. We went over Lambeth Bridge and, being in good time, went along the Mall to Buckingham Palace before cycling to Parliament Square and parking our bikes on the racks outside Portcullis House. There are more and more people riding bikes or walking across the bridges. And many more would like to if the conditions were made more pleasant. As London grows we also need more people using public transport which means letting the public transport have road space as well as the cyclists and essential lorries/vans. But we don't want 6 lane gyratories. So, what's the solution? It's simple: the space-guzzling private motorist has got to lose road space in a major way. Read these two excellent posts to get the picture. A typical Vauxhall gyratory motorist? 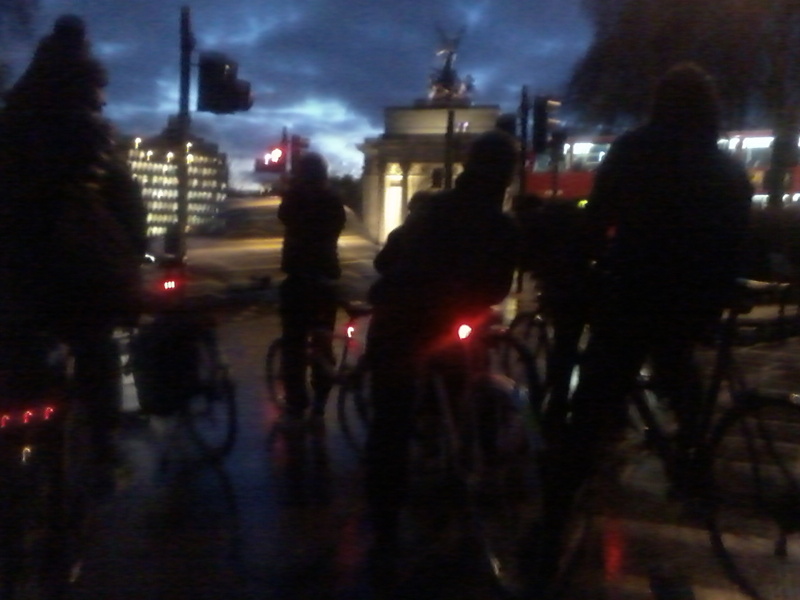 In determining solutions to the horror that is Vauxhall gyratory the starting point must be to ask how essential are the journeys that motorists take through Vauxhall and why do they choose to make them? It took a lot of effort and persuasion for us to prevent an unnecessary one on Saturday. 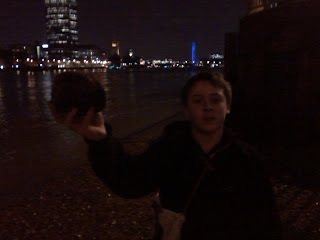 Our daughter had taken the train from Vauxhall to Wimbledon to visit a friend, scheduled to return around 8pm. The friend's parents were desperate to drive her 'safely' home rather than let her take the train. It took several texts and phone calls between us and them to reach a compromise they found acceptable - they accompanied her on the train and delivered her to us at the barrier. On the one hand I admire their level of care; on the other my mind boggles at the perception of risk they have about public transport (which we all use routinely) and their lack of appreciation of the impact that their car usage has. The solution to Vauxhall is stunning in its simplicity. Simply reduce the volume of roadspace and prioritise pedestrian, bus and cycle use. You'll be amazed at how quickly the non-essential motorist will switch modes of transport given a firm enough nudge. The motoring industry are out in force to try to persuade the Government not to increase fuel duty. 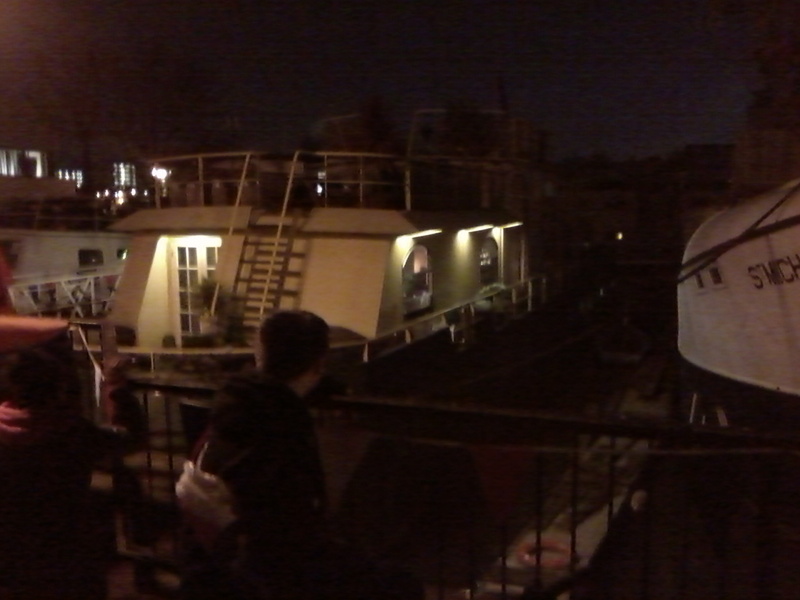 They've got a silly Valentine's Day stunt tomorrow. CLS Holdings plc, a property company in Vauxhall, have a very tall buildings project planned. They also propose a 'Linear Walkway' as a solution to the problem of pedestrian movement around Vauxhall Gyratory. It's deeply questionable whether it will improve the environment for cyclists. 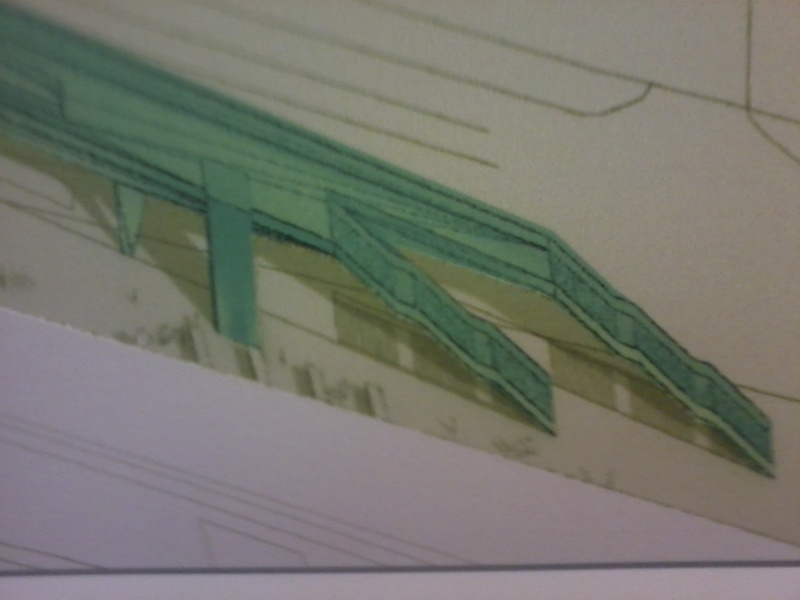 A cynic might suggest that proposing an innovative walkway scheme could be a wonderful example of the type of misdirection used by magicians who wish to draw attention from an important issue - maybe in this case the height of the proposed buildings. But my concern is a different kind of misdirection. 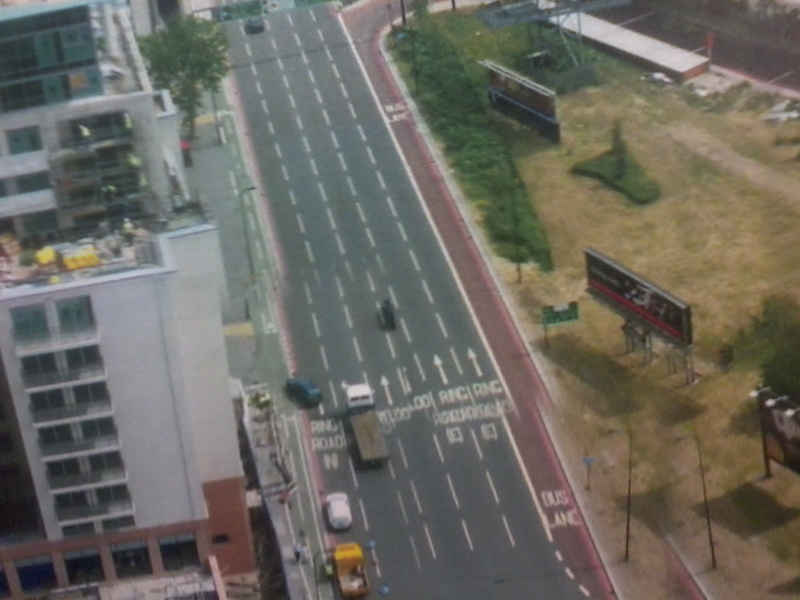 Laying a pedestrian walkway over the Vauxhall gyratory does nothing to resolve the (literally) underlying issue of an enormous amount of space given over to motor traffic. During rush hour today I attended the exhibition put on by the developers at the top of Market Towers on the Gyratory. From ground level and then looking down from the heights of the Towers it was quite clear that the vast majority of motor vehicles dominating this area are not lorries, vans or buses, but cars, mostly with a single occupant. And the solution to the urban blight of Vauxhall is not a sticking plaster walkway over the top but a major operation to cut out the needless use of the private motor car in Central London (and let's be clear, with the American Embassy, Battersea Power Station Development et al this IS Central London now). I hope the Vauxhall, Nine Elms, Battersea Opportunity Area Planning Framework will force a proper resolution of this issue throughout the area. 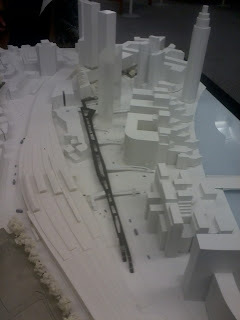 I have my doubts, not least because, mindboggingly, the Vauxhall Gyratory isn't included in the area! I urge you to write to your MP and Councillors, and to Transport for London, making it clear that you consider the continuing dominance of the single occupant motor car, blighting this area, to be completely unacceptable. There's a calm and attentive atmosphere between 4 and 5.30pm on Mondays and Tuesdays at Pedal Power Kennington. 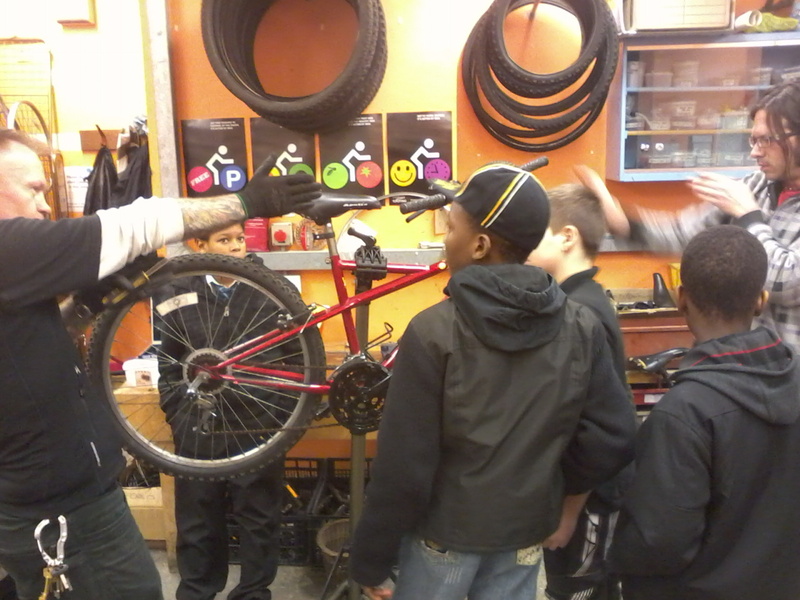 Digger and Leo teach cycle maintenance across five Mondays, with Pim and Leo teaching on Tuesdays. I've been impressed at the continued attendance of the trainees. 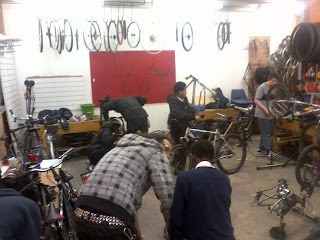 From 5.30 - 7pm we revert to a drop in workshop where 10-16 year olds bring their bikes to mend or work on ones we've had donated. Everything is up in the air at the moment about the future of the Lilian Baylis site we're based at, with the Council resolving how to move it forward. Let's hope everything pans out well. 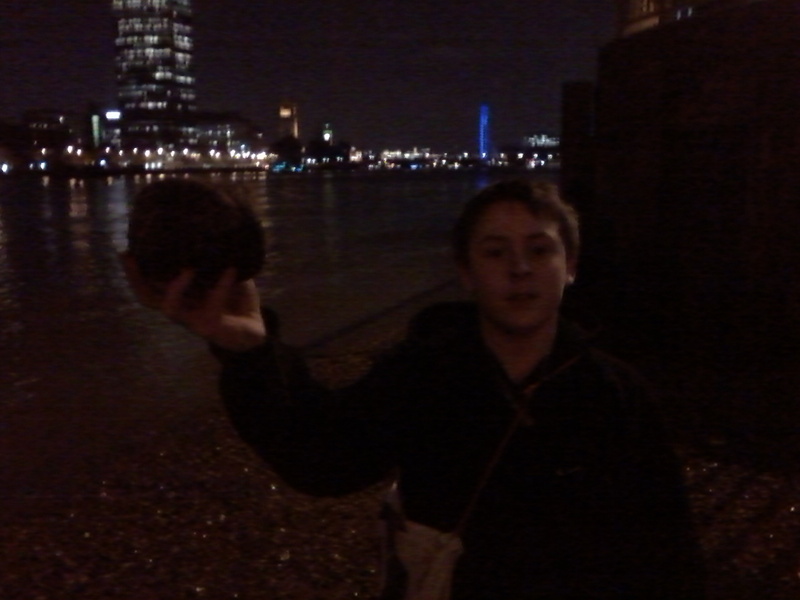 stopping by the MI6 building to scavenge the foreshore which yielded a tasty coconut we enjoyed eating at the end of the ride. 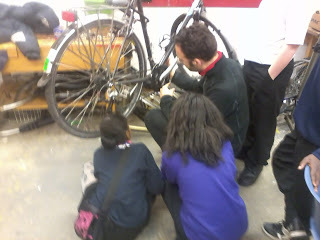 A Lambeth Cyclists course, run by a Brixton Cycles mechanic, at Pedal Power Kennington. Five Wednesdays, starting February 16th, 6.45pm – 8.45pm. * 5th week: fix any particular problems you have, follow up from previous weeks. And you will get a handout at the end of each week, as a reminder. Each class will consist of 8 participants, working in pairs on their own bikes. Tools and workstands will be provided. Some spares can be bought at the classes. Preference will be given to London Cycling Campaign (www.lcc.org.uk) members who live or work in Lambeth. People often join the LCC to get a place as the classes are so popular. To reserve a place please email Chrisj52@hotmail.co.uk who will check there are spaces and ask you to send a Cheque for £55 (or £5 if on Income Related Benefits) payable to Lambeth Cyclists. 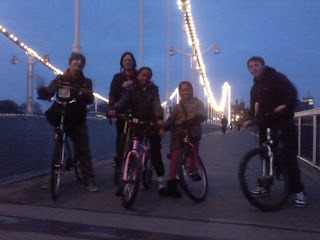 Pedal Power Kennington had the first 2011 fortnightly Wednesday after school ride on a cold day in January. 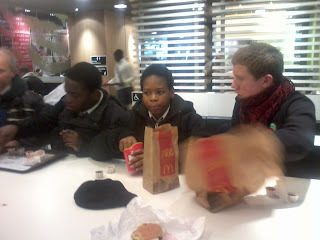 We went via the Wellington Arch and Hyde Park to the Marble Arch McDonalds! The new five week courses for 10-16 year olds are working well and there's been a delivery of bikes from the South Bank Employer's Group. 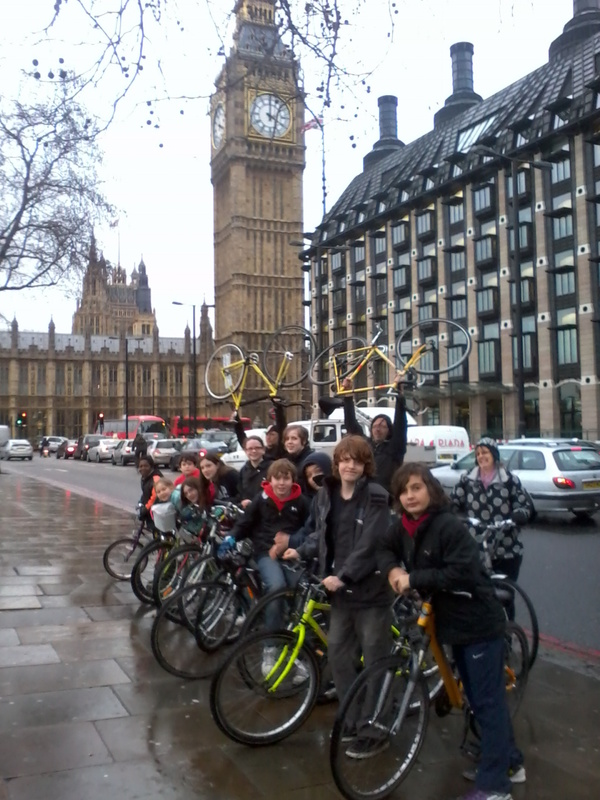 Best of all Lambeth Cyclists have given £1200 to help the project continue and we're arranging activities at Charlotte Sharman and, hopefully, Notre Dame schools. Pop the cork, it's Champagne time! A recent decision has been made to take down the 'No Cycling' signs along the Lambeth owned stretch of river walk and instead erect: Pedestrian Priority. Considerate Cycling Welcomed This will however take a couple of weeks to come into effect in order to get new signs made up and to replace the existing ones. We are really keen to tackle aggressive cycling along this stretch; however want to achieve this through a mixture of education methods and PCSO's stopping those they feel are cycling too fast.